Family Confirms U.S. Hostage Kayla Mueller Dead : The Two-Way In a statement, her family said they had received information the 26-year-old was dead. Mueller, who was captured in August 2013, was a prisoner of the self-described Islamic State when she died. 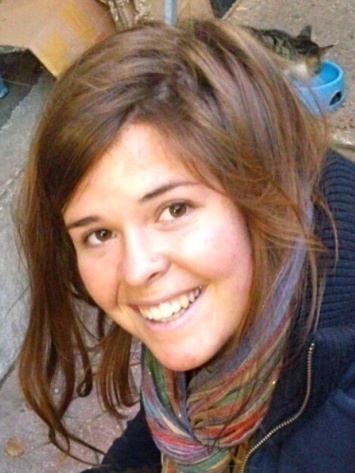 Members of the family of Kayla Mueller, 26, have confirmed that their daughter has died. She had been held captive since being taken prisoner in 2013 while doing humanitarian work in Syria. As we reported Feb. 6, the Islamic State said Mueller, 26, died after Jordanian airstrikes against the militant group targeted the building in Syria where she was being held. Jordan is part of the U.S.-led coalition against the Islamic State. There has been no official confirmation about how Mueller died. Mueller, an aid worker from Prescott, Ariz., was captured Aug. 4, 2013, as she left a Doctors Without Borders hospital in Aleppo, Syria. "We are heartbroken to share that we've received confirmation that Kayla Jean Mueller has lost her life," Mueller's parents, Carl and Marsha Mueller, and her brother, Eric, and his family, said in a statement. President Obama, in a statement, said Mueller "represents what is best about America, and expressed her deep pride in the freedoms that we Americans enjoy, and that so many others strive for around the world." 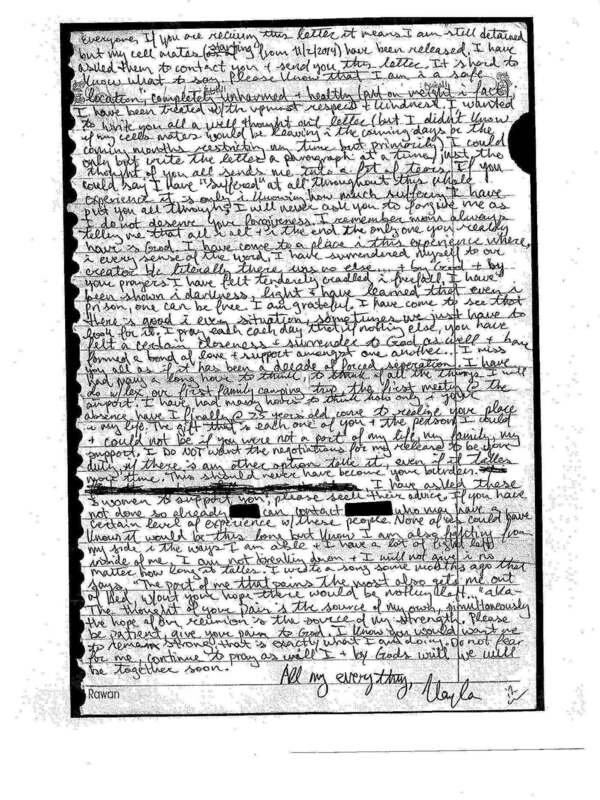 National Security Council spokeswoman Bernadette Meehan said the Muellers received "additional information" over the weekend from the Islamic State that confirmed Kayla Mueller had died. The intelligence community authenticated that information, Meehan said. At a news conference, Mueller's family and friends described her as generous and caring, and as a free spirit who was full of empathy. "She did ordinary things to extraordinary measures," Kathleen Day, a friend, said. In a letter to her family in Spring 2014, while still in detention, Mueller wrote she was in "a safe location completely unharmed + healthy (put on weight in fact); I have been treated w/ the utmost respect + kindness." In his statement, Obama said: "No matter how long it takes, the United States will find and bring to justice the terrorists who are responsible for Kayla's captivity and death." Neither the family statement nor the one from the White House specified how Mueller died. "Since graduating from Northern Arizona University in 2009 after only two and a half years, Kayla devoted her career to helping those in need in countries around the world. The suffering of the Syrian refugees drew Kayla to the Turkish/Syrian border in December, 2012, to work with Support to Life, the Danish Refugee Council and other humanitarian organizations to assist families who had been forced to flee their homes. Kayla found this work heartbreaking but compelling; she was extremely devoted to the people of Syria. "From her college graduation through 2011, she lived and worked with humanitarian aid groups in northern India, Israel and Palestine. She returned home to Arizona in 2011, and worked for one year at an HIV/AIDS clinic while volunteering at a women's shelter at night. "Prior to her work in Syria, in December 2011, Kayla worked as an au pair in France to hone her fluency in French in preparation for her work in Africa. "The common thread of Kayla's life has been her quiet leadership and strong desire to serve others." In a statement, Secretary of State John Kerry said, "ISIL, and ISIL alone, is the reason Kayla is gone." ISIL — for the Islamic State of Iraq and the Levant — is another name for the Islamic State; the group is also referred to as ISIS.